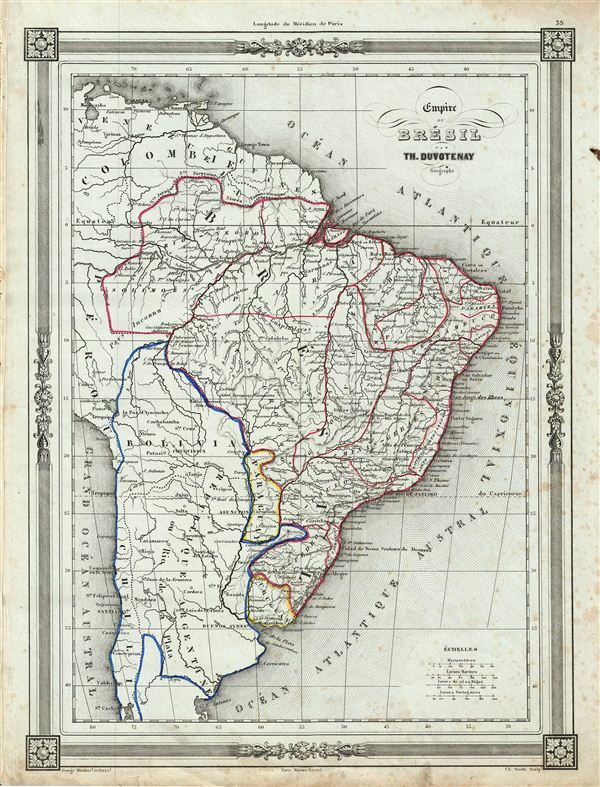 An uncommon and extremely attractive 1852 map of the empire of Brazil. Covers all of modern day Brazil from Guiana and Venezuela in the north to Uruguay in the south and from Chile in the west to the Atlantic. Includes Brazil, Uruguay, Paraguay, Bolivia, Argentina, Chile, and parts of Peru. Throughout, the map identifies various cities, towns, rivers and assortment of additional topographical details. In Brazil, after proclaiming the country' independence in 1822, Dom Pedro I became first emperor. This period also witnessed Brazil in the Platine War, fought between Argentina and the alliance of the empire of Brazil, Uruguay and some Argentine provinces for influence over Uruguay and Paraguay. The map features a beautiful frame style border. Prepared by Th. Duvotenay for publication as plate no. 35 in Maison Basset's 1852 edition of Atlas Illustre Destine a l'enseignement de la Geographie elementaire. Thunot Duvotenay (1796 - 1875) was a French geographer active in the mid 19th century. Thunot is known to have worked with several other important cartographers of his dayincluding Barbie du Bocage, Vuillemin, Charle, Levassseur and Dufour.